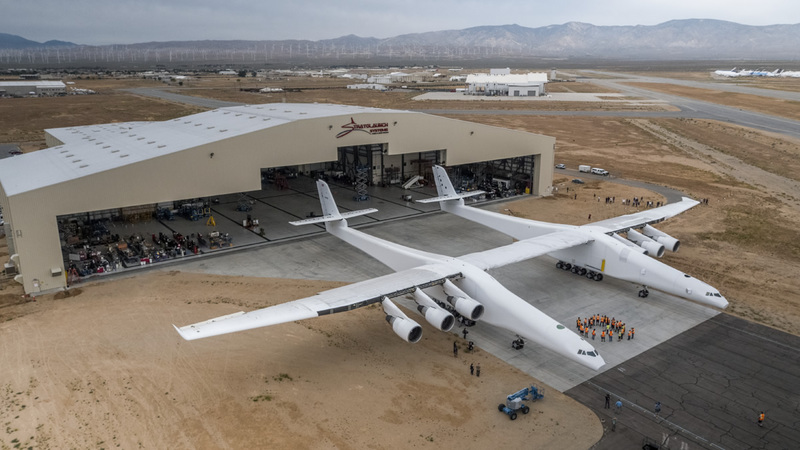 The Stratolaunch aircraft was revealed for the first time on May 31 for a fueling test after completing the critical milestone of its construction phase; the company rolled the vehicle from its hangar and will now begin the aircraft’s next stage of development. The aircraft and the company’s offerings are working to reduce the wait times for potential customers between the construction of a satellite and its launch into space. Stratolaunch is the largest plane by wingspan that has been produced to date. From wingtip to wingtip, the aircraft measures in at 385 feet (117 meters) – making it longer than a National Football League field (360 feet or 110 meters). The aircraft is 238 feet (73 meters) from nose to tail and stands an imposing 50 feet (15 meters) tall from the ground to the top of its vertical tail. With its 28 wheels, the aircraft has a max weight at takeoff of 1.3 million pounds (590,000 kg) and is designed to carry up to 550,000 pounds (249,500 kg) of cargo, including satellites. During its reveal, the company weighed the aircraft at 500,000 pounds (226,800 kg). The airframe is made of carbon fiber and uses six Pratt & Whitney PW4056 engines, which are also used on Boeing 747s. 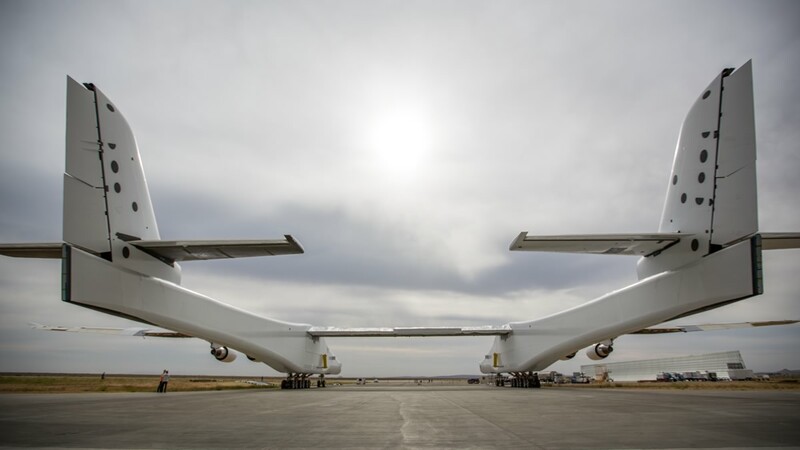 The center wing of the aircraft will provide lift, stability, and an attachment point for the multiple payloads that Stratolaunch will be used to send aloft. Stratolaunch announced a partnership with Orbital ATK, its first major customer, last autumn to launch Pegasus XL vehicles from the enormous aircraft. Their plan is to send three Pegasus rockets to space at the same time, during one sortie mission. Pegasus, itself, is capable of carrying small satellites weighing up to 1,000 pounds (454 kilograms) to orbit for scientific, commercial, defense missions or on behalf of international customers. Pegasus is the first air-launched rocket to place satellites into orbit. The launch vehicle typically delivers satellites into orbit within ten minutes. It has conducted 43 missions to date, launching 94 satellites. “Orbital ATK is the world’s most experienced air-launch service provider, and we are proud to leverage that expertise and progressive approach in pursuit of our shared goal of convenient and affordable commercial access to low-Earth orbit,” Jean Floyd, CEO of Stratolaunch said, noting the partnership between the two companies. If everything continues to go as planned, Stratolaunch will now begin flight testing, which includes ground testing, taxi tests, and eventually the first flight out of the Mojave Air and Space Port. The company hopes to perform the first launch demonstration mission in early 2019. Stratolaunch was founded by Paul Allen, the co-founder of Microsoft, in 2011. The company partnered with Scaled Composites to achieve Allen’s vision of “normalizing access to low-Earth orbit”. Allen previously worked with Scaled Composites to design SpaceShipOne, the first privately funded spacecraft to carry an astronaut into suborbital space. She finally done, this has been in year in the making. I’m surprise there no fittings in the middle of the center part of the win for the payload. Strange to see this partially complete airframe after all of this lead time. Does it even have fuel tanks in those cavernous wings and are they stressed enough to take being filled without buckling? With this extreme unsupported gap between the tails is cringe worthy in that any twisting due to crosswinds could break apart this weak center section of the wing despite any strengthening the forces involved will require computer speed reflexes in each separate tail controller to manage the separate wind stresses. Modelling such an event is never the same as the actual event so another gamble. With the extreme cost and lead time to build this these are not idle questions. No leading edges on the wings means cannot even do high speed taxi tests since the blunt edges could induce instability and rock the whole thing off the taxiway and into the weeds at any speed beyond 20kph. This is exactly like putting all of your eggs in one basket because if any damage at all occurs on the first flight it is likely to be a total loss of airframe with fatalities and beyond recovery. I wish I felt more optimistic about this but it just looks like a rolling parade float that could become a firey death spiral at any moment after launch. I really do not lok forward to reading how it broke up over a major city and spilled hundreds of tons of burning fuel down onto the heads of the people there.